For the first time in cosmetology, Uriage has unveiled the very first patented anti-blue light solution that protects the skin. The BLB (Blue Light Barrier), an innovation developed by Uriage’s research team, was designed to protect the skin against blue light waves. Thanks to a combination of vegetable extracts, vitamins and pearly agents, the BLB Complex acts as a protective asset, limiting the harmful effects of waves on the skin. Uriage, specialist in skin barrier protection, formulated its first cosmetic response to this modern issue. 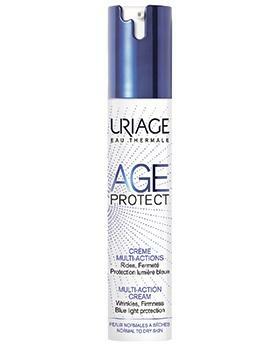 Age Protect is the new Uriage thermal water-based antiaging range, capable of fighting the exposome and blocking blue light.